This lovely filly is by the fastest two-year-old son of Champion sire Street Cry, Pride Of Dubai. Bred to become a stallion, Pride Of Dubai is closely related to Champion sire Invincible Spirit and leading two-year-old sire Kodiac. He was an exceptional juvenile being the only horse to win the Group 1 Blue Diamond Stakes/Group 1 Sires' Produce Stakes double. Street Cry has already seven individual sons that have sired Group 1 winners and Pride Of Dubai has all the credentials to become a Group 1 producing sire. This is Pride Of Dubai's first crop yearlings and they have been very well received in the sales ring. This filly is the first foal out of the city-winning Fastnet Rock mare Jezzabba. Jezzaba's dam was an exceptional race mare and the winner of the Group 1 Manikato Stakes among her multiple black type victories. As a broodmare she is the dam of seven winners including Group 1 Sires' Produce winner and Golden Slipper runner up Von Costa De Hero and Listed place-getter Taarish. Out of a half-sister to a very talented juvenile, this filly hails from a family of speedy two-year-olds. With a physique to match, we expect to see this daughter of Pride OF Dubai at the races before Christmas. JEZZABBA, by Fastnet Rock. 3 wins at 1200m, 1400m, MRC Beck Property Group P., Ladbrokes Live Play H., 2d MRC Grand Hotel Frankston H., 3d MVRC Ranvet H. Half-sister to VON COSTA DE HERO, Taarish. This is her first foal. VON COSTA DE HERO (c Encosta de Lago) Winner at 2, A$1,124,450, VRC Sires' Produce S., Gr.2, 2d STC Golden Slipper S., Gr.1, VRC Australian Guineas, Gr.1, 3d MRC Caulfield Guineas, Gr.1, MVRC Norman Carlyon S., Gr.2, MRC Caulfield Guineas Prelude, Gr.3, 4th VRC Coolmore Stud S., Gr.1, MRC Blue Diamond Prelude (c&g), Gr.3. Sire. 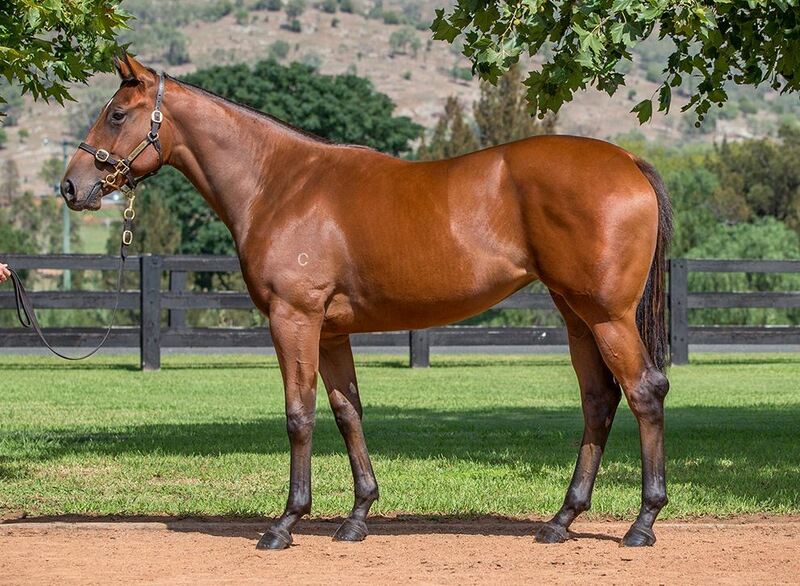 Taarish (g Encosta de Lago) 5 wins from 1400m to 2400m, R346,800, Fairview Lakeside H., Racing. It's a Rush S., Turffontein Thank You for Your Support H., 2d Greyville KZN Guineas Trial, L, 4th Fairview Glenlair Trophy, L, Port Elizabeth Gold Cup, L.
Jezzabba. 3 wins. See above. Aneefa. 2 wins-1 at 2-at 1800m, 2000m, Vaal Algoa Cup Festival H., 2d Turffontein All to Come Juvenile P.
Khataaf. 12 wins from 950m to 1650m, A$123,375, 2d Qld Tatt's RC Tattersall's Arcade H.
Prince of Arabia - Northern Prince (Sing.). Winner at 1200m in Aust. Al Yamama. Winner at 1200m in Aust. Producer. Bint el Bedu. 3 wins from 1600m to 2050m, A$113,450, to 2017-18, 2d VRC Doriemus H., 3d MRC Blue Star Print Group H., 4th MRC Galilee Series Final H., L.
Hikaya. Winner at 1200m in 2018-19, 3d SAJC Ubet 2YO P., MRC Spicer Thoroughbreds 2YO P., Ladbrokes Back Yourself H.
PIAVONIC (f Scenic) 9 wins. See above. Stennar. 3 wins at 1200m, 1400m, VATC Galleon H., 2d MVRC Moonee Valley Super VOBIS 2YO H., VATC The Journal H., Campbells Warehouse H., MVRC Sport 927 H.
Piave Girl (f Brave Salute) 4 wins. See above. Segusino (c Habituate) 6 wins-2 at 2-at 1000m, SAJC Atropine H., Quit & Win H., 2d SAJC Balcrest S., L.
EMLOZZA (f Encosta de Lago) 5 wins at 1000m, 1200m, A$231,550, MRC Thoroughbred Club S., Gr.3, SAJC Dermody Lightning S., Gr.3, MVRC Watsons Catering Equipment H., MRC Stan Shannon H. Producer. DOPPIO (g Umatilla) 8 wins from 1100m to 2000m in Aust. and Macau, Macau Derby, L, Macau Winter Trophy, L.
MIO DIO (g God's Own) 11 wins-1 at 2-to 1250m, A$382,265, to 2017-18, SAJC Spring S., Gr.3, Swan Hill JC Golden Topaz H., VRC Garden View Pavilion H., SAJC MAC Drink Driving? Grow Up H.
BEL THOR (g God's Own) 4 wins from 1400m to 2000m, A$338,200, Seymour Cup, L, 3d MRC Eclipse S., Gr.3.